OZÎJA THIHA (meaning “bear’s foot”; Jacob Bearspaw; Mas-gwa-ah-sid, which reflects the Cree translation of his name), Stoney warrior and chief; b. c. 1837; d. 1903, probably near Morley (Alta). Closely related to the Assiniboin of the prairies, the Stoney people by the mid 19th century roamed the foothills country in what is now southern Alberta. Up to the 1860s they were bitter enemies of the Blackfoot tribes, their neighbours to the east. As a young man Bearspaw gained a reputation for his fierceness and daring. 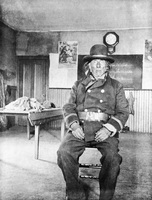 It has been said that he “never missed a chance to kill a Blackfoot.” Stoney informants have explained that Bearspaw’s mother was killed by a Blackfoot. Oral tradition has it that the hereditary band chief, who was a relative of Bearspaw, passed over his own sons in choosing him as his successor. Perhaps he recognized the strength of character that was to make Bearspaw a respected leader and a steadfast peacemaker. The Stoney had been in contact with Methodist missionaries since the 1840s. 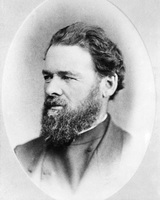 Bearspaw got to know the Reverend John Chantler McDougall* and encouraged him, and his father George Millward McDougall*, to set up a mission in Stoney territory, a step that was taken in 1873. The missionaries’ presence reflected the westward advance of white society, a development that presented Bearspaw with the greatest challenge of his career. He had to obtain the best possible protection for his people in the face of the new political realities. When the Canadian government sent out representatives in 1877 to negotiate a treaty with the Indian nations of what is now southern Alberta, Bearspaw hastened from Chief Mountain, Mont., part of the band’s traditional hunting territory, to take part in the proceedings. With a delegation of two other Stoney chiefs, John Chiniquay and Ki-chi-pwot (Jacob Goodstoney or Big Stony), and five councillors, he attended the meetings at Blackfoot Crossing in September. According to Stoney oral tradition, “Bear’s Paw was the first Indian who accepted the treaty. The rest of them did not. They wanted to fight. Bear’s Paw was an extremely wise man.” In the account of the proceedings published in the Toronto Globe, Bearspaw is reported to have said “that he was pleased with the treaty, the Police, and the prospect of getting provisions and money.” The Globe’s correspondent was moved to observe that “this Chief appeared by his speech to be of a mercenary bent,” a comment which in the circumstances ought to be regarded as high praise for Bearspaw’s understanding of what was at stake in the negotiations. Treaty No.7, signed on 22 September, was vague about the location of a Stoney reserve, saying only that it was to be in the vicinity of Morleyville (near Morley). The clause guaranteeing Indians the “right to pursue their vocations of hunting throughout the Tract surrendered” may have appeared to offer protection for their traditional way of life. What was implied by the limitations on that right remained to be seen: it was to be “subject to such regulations as may, from time to time, be made by the Government” and excepted “such Tracts as may be required . . . for settlement, mining, trading or other purposes.” Both the location of the reserve lands and the definition of hunting rights proved to be matters of much dispute in later years and would periodically come under litigation. Bearspaw, along with his fellow leaders, repeatedly lobbied the federal government to grant the Stoney tribe additional reserve land and to respect their hunting rights as promised under the treaty. The three Stoney chiefs formally established a land committee in 1898 to pursue territorial claims. Despite their many disappointments, the Stoney kept the promises they had made when they took treaty. At the time of the 1885 uprising [see Mistahimaskwa*], Bearspaw and the other two chiefs signed a telegram to the Indian commissioner in Regina affirming their loyalty, and Stoneys served as scouts for the Canadian militia. According to government records, Bearspaw was “moral, sober, honest, industrious & looks well after his Band.” Missionary John W. Niddrie, who knew him from 1890 until his death in 1903, described him as a “rugged old warrior” who “adhered to what he considered just and right.” He is buried in the Bearspaw Band cemetery on the Stoney Indian Reserve. GA, M4390, vol.1, note on Chief Bearspaw. Whyte Museum and Arch. of the Canadian Rockies (Banff, Alta), M396 (Hermann Hagedorn papers), folder 3 (transcript of interview with George McLean [Tatânga Mânî). Marius Barbeau, Indian days on the western prairies (Ottawa, 1960). Can., Parl., Sessional papers, 1901–5, annual reports of the Dept. of Indian Affairs, 1900–4. W. E. A. Getty, “Perception as an agent of sociocultural change for the Stoney Indians of Alberta” (ma thesis, Univ. of Calgary, 1974; copy at the Nakoda Institute). Morris, Treaties of Canada with the Indians. J. W. Niddrie, “Memories of Morley,” ed. J. W. Chalmers, Alberta Hist. (Calgary), 40 (1992), no.3: 10–13. John Snow, These mountains are our sacred places: the story of the Stoney Indians (Toronto and Sarasota, Fla, 1977). “Stoney history notes,” comp. P. M. Jonker (20-page pamphlet issued by the Chiniki Band of the Stoney Indians, Morley, 1983). Ian A. L. Getty, “OZÎJA THIHA,” in Dictionary of Canadian Biography, vol. 13, University of Toronto/Université Laval, 2003–, accessed April 22, 2019, http://www.biographi.ca/en/bio/ozija_thiha_13E.html.